Tribal Tiki Mask Wood Wall Patio Tropical Bar Decor 20"
Bhairav or Bhairab refers to Bhairava, a fierce manifestation of Lord Shiva. 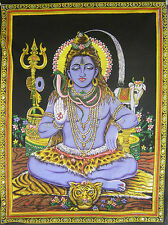 It is a fierce form of Shiva. Bhairav Mask Wall Hanging. 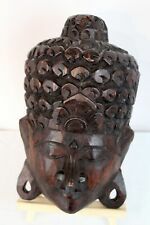 Bhairav Mask. Very well made with good finishing. Inside the mask colorful light can be installed to give a glow from mouth. 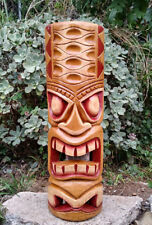 These wooden tiki god wall decor beach style decorations are excellent for the yard around the grass and tiki torches. Mask makes a great gift for any age! Wall hanger attached the back of mask. This is an exceptional piece of handmade art! Height 8" x Width 3.5". This is an exceptional piece of handmade art! Hand carved and painted in Indonesia. Height 12.5" x Width 5.5". This is an exceptional piece of handmade art! Height 12" x Width 4". Hand carved and painted in Indonesia. this is an exceptional piece of handmade art! Height 12" x Width 4". This is an exceptional piece of handmade art! Height 19.5" x Width 6.5". For adult; one size fits all. Black ribbon tie. Made in China. UPC 831687072284.
International Signed For (if I'm sending outside UK). Sold as shown in pictures. 1st or 2nd Class Recorded . Otherwise I will file for credit. Wonderful bright gold trim and paint provide a touch of bling. Sure to be an appreciated gift, or keep for yourself! International Priority is FAR superior in many ways, but expensive, I know. 7" wide at widest point. Handcrafted New England Patriots Tiki Mask. Great wall art for any fan. This is an exceptional piece of handmade art! Hand carved and painted in Indonesia. Height 13" x Width 5.5". 7" x 4 1/2". Reference #65207. This is an exceptional piece of handmade art! Hand carved and painted in Indonesia. Height 12" x Width 4". The item is in good condition, but does have a lot of crazing cracks on it. The mask is 8" by 6". "Just Joking". Clown Wall Face Mask. Ceramic Clay Art. "A division of Clay Art". Clay Art Decorative Masks are NO Longer Manufactured. Made in San Francisco. "ABOUT FACE". Clean Detail. Wood Mask Multicolor Indonesia Balinese Colorful Wall Art Handmade Tribal 14"
Ceramic Clay Art "PUNK FAB" Wall Face Mask. "ABOUT FACE" "A division of Clay Art". Clay Art Decorative Masks are NO Longer Manufactured. Made in San Francisco. Good Vivid Color. I try to show all pictures with detail & explain my Item to the best of my ability. "Harlequin Clown". Ceramic Clay Art. Wall Face Mask. "A division of Clay Art". Clay Art Decorative Masks are NO Longer Manufactured. Made in San Francisco. "ABOUT FACE". Good Vivid Color. Statuette africaine décoration ethnique. Hauteur totale : 16,5 cm Poids : 0,390kg. En bel état. (Si vous choisissez Mondial Relay pour la France . ). This is from my older collection which I brought over 15 years ago. I had this in storage. They are hand carved from albesia wood. 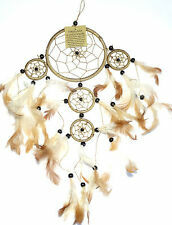 These would look great in any tropical, tribal, tiki or jungle room. It has been in my possession for the last 30 years and was a gift. 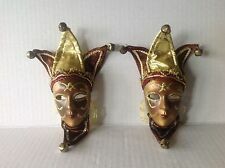 Ceramic Clay Art " Royal Jester" Wall Face Mask. "A division of Clay Art". Clay Art Decorative Masks are NO Longer Manufactured. Made in San Francisco. "ABOUT FACE". Good Vivid Color. I try to show all pictures with detail & explain my Item to the best of my ability. Lombok Tribal Tattoo Wood Wall Mask with Turtle Dayak Design Island Art Tiki 61"
The artists hand draws the design onto the mask and then carves it out. Rattan vine is used around the mask as a nice accent to this mask. They are hand carved from albesia wood. 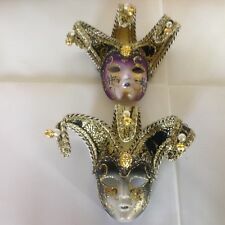 These masks would look great in any tropical, tribal, tiki or jungle room. VINTAGE~1970'S~CAST OF THOUSANDS~WALL DECOR MASK~MADE IN SAN FRANCISCO~V/G/COND. STILL ATTACHED IS THE ORIGINAL LABEL. They are as close to their original state as possible, which I personally prefer, and hope you do also. I will correct any problems.